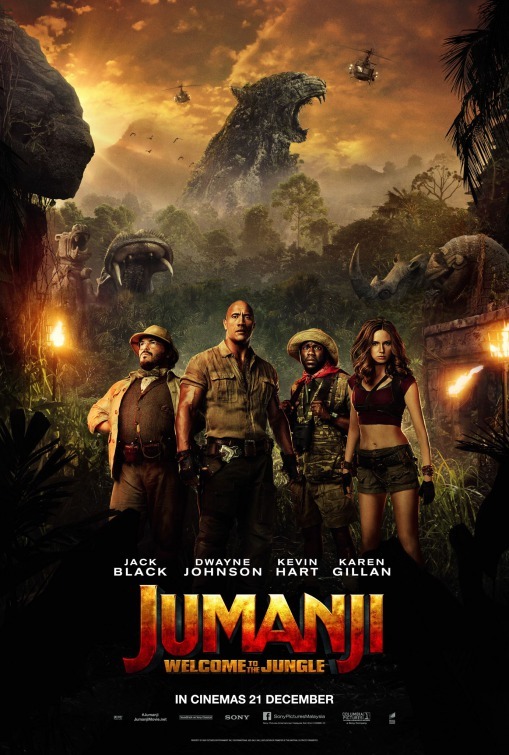 In a brand new Jumanji adventure, Jumanji Welcome to the Jungle, four high school kids discover an old video game console and are drawn into the game’s jungle setting, literally becoming the adult avatars they chose. What they discover is that you don’t just play Jumanji – you must survive it. To beat the game and return to the real world, they’ll have to go on the most dangerous adventure of their lives, discover what Alan Parrish left 20 years ago, and change the way they think about themselves – or they’ll be stuck in the game forever. Dwayne “The Rock” Johnson leads the cast. Jumanji Welcome to the Jungle is a reboot of the 1995 movie Jumanji, which took in $100 million at the U.S. movie box office during its theatrical release. The late Robin Williams headlined the original Jumanji movie. 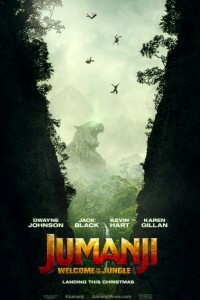 Dwayne “The Rock” Johnson stars in the lead in Jumanji Welcome to the Jungle. The director of this Jumanji, Jake Kasdan, is the son of Oscar nominated writer and director Lawrence Kasdan (The Big Chill, The Accidental Tourist, Grand Canyon). Lawrence Kasdan also wrote the screenplays for The Empire Strikes Back, Return Of The Jedi, Body Heat, Raiders Of The Lost Ark and the stand alone Star Wars film, Han Solo, which has a 2018 release date.